1. 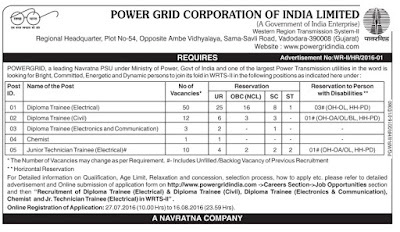 Diploma Trainee (Electrical) - Diploma in Electrical Engineering from recognized Technical Board/ Institute with minimum 70% marks for General/OBC(NCL) candidates and pass marks for SC/ST/PwD Candidates. 2. Diploma Trainee (Civil) - Diploma in Civil Engineering from recognized Technical Board/ Institute with minimum 70% marks for General/OBC(NCL)/ST candidates and pass marks for SC/PwD Candidates. 3. Diploma Trainee (Electronics & Communication) - Diploma in Electronics & Communication Engineering from recognized Technical Board/Institute with minimum 70% marks for General/ OBC (NCL)/ST candidates and pass marks for SC candidates. 5. Jr. 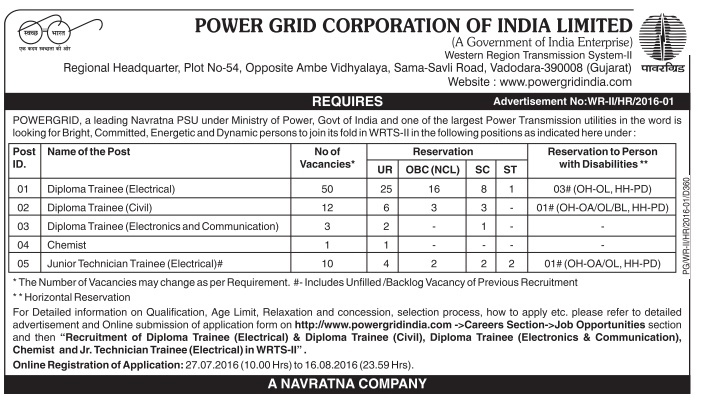 Technician Trainee (Electrical) - ITI (Electrical) pass in Electrician Trade from recognized Technical Board/ Institute.